Bob Pittman and AOL Time Warner. Jean Marie Messier and Vivendi. Jill Barad and Mattel. Dennis Kozlowski and Tyco. It's an all too common scenario. A great company breaks from the pack; the analysts are in love; the smiling CEO appears on the cover of Fortune. Two years later, the company is in flames, the pension plan is bleeding, the stock is worthless. What goes wrong in these cases? Usually it seems that top management made some incredibly stupid mistakes. But the people responsible are almost always remarkably intelligent and usually have terrific track records. Just as puzzling as the fact that brilliant managers can make bad mistakes is the way they so often magnify the damage. Once a company has made a serious mis-step, it often seems as though it can't do anything right. How does this happen? Instead of rectifying their mistakes, why do business leaders regularly make them worse? To answer these questions, Sydney Finkelstein has carried out the largest research project ever devoted to corporate mistakes and failures. 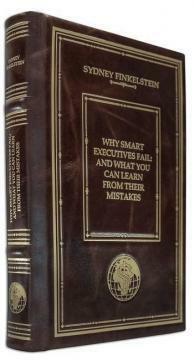 In WHY SMART EXECUTIVES FAIL, he and his research team uncover-with startling clarity and unassailable documentation-the causes regularly responsible for major business breakdowns. He relates the stories of great business disasters and demonstrates that there are specific, identifiable ways in which many businesses regularly make themselves vulnerable to failure. The result is a truly indispensable, practical, must-read book that explains the mechanics of business failure, how to avoid them, and what to do if they happen. The French all-leather binding of handwork is made of genuine leather (leather "Gabinetto" produced by the Italian tannery "Benericetti"). The cover of the book is two-level, decorated with multi-level embossing: deep blint and relief gold, using the "Luxor 240" foil. The cut is manually polished and gilded with gold leaf. Certificate in set, velvet cover.